Wouldn’t it be great to see your website bringing in more customers for your business? Google Ads (formally known as Google Adwords) is a paid service that helps your company get found on Google Search results. Web Revolution will manage Google Ads for you, making sure it works together with your online marketing strategy to give you the marketing results you desire. We help maximise your Ad budget by finding the right keywords, writing great Ad copy and creating targeted landing pages. Google Ad is a powerful tool which can almost immediately increase traffic to your website or landing page. We can put your message in front of potential customers at the very moment when they are searching for the goods and services your business offers. We can use our knowledge to optimise both your campaigns and landing pages for conversion. Let’s talk about how Google Ads can increase your traffic and website results! Together we work to produce a range of keywords that you want your business to be found for in a Google Search. From those target keywords, we prepare the advert that will showcase your business when these phrases are being searched. From here, with a simple mouse-click, the searcher can go from the Google Ad to one of your current pages or we can create focused landing pages. Linking your Google Ads promotions to your home page is good, but it won’t get the same results as if the potential customer was taken to a dedicated landing page. 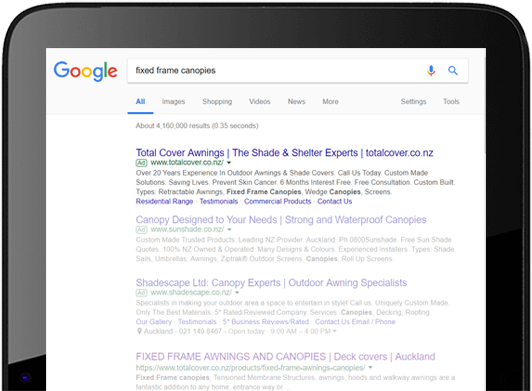 We can create separate pages for each advert so you can focus on the needs of each individual customer, and you can see how well Google Ads is working for you. That means you can ensure a maximum return on your investment. WANT HELP MANAGING YOUR GOOGLE ADS? We can help guide you through the set-up process of Google Ads, and the creation of landing pages and the link to assist with converting clicks to sales for you. Maybe you’re already running your own Google Ads campaign but you’re not getting the sales you’d hoped for; give us a call and we’ll make it work for you.